Secondly, Ying Zheng, who had become Qin Shi Huang, rescinded aristocratic titles, and adopted the political system of centralized authority. He established the Cabinet at the central government level, called the system of Nine Ministers or the Nine Cabinet Members. Locally, he adopted the county system which divided the country into counties. All officials were appointed by the emperor. The emperor could retain or remove any official at his will. Thirdly, strict rule of law was implemented. From the highest ranking officials to the lowest social stratum across the country, everyone had to obey the harsh and detailed laws of the Qin empire. Violators were prosecuted without exception. Fourthly, written characters in the various warring states were unified. Although ancient Chinese characters were used by all states, there were variations in strokes or choice of characters. The Qin government issued the standard for written characters. The “lesser-seal” of Qin became the official written language, to be used by all officials and ordinary citizens. Fifthly, monetary and measuring systems were unified. Universal length gauge, volume gauge, currency, and even the distance between the wheels of a horse-drawn wagon were all unified. It took Qin Shi Huang just 16 years since he fully assumed the role of the King of Qin till he fully unified China. Of course, his predecessors had laid the ground work. After the unification, Qin Shi Huang toured his new empire, inspecting the newly subordinated regions. Well constructed paths led to various regions in China, which facilitated the swift mobilization of his military forces. These wide paths were said to allow the passage of four horse-drawn wagons in parallel. They radiated from the capital to remote counties in the outer fringes of the empire. To counter harassment from the Xungnu pastoral nomads in the north, Qin Shi Huang ordered the connection of the Long Walls along the northern borders of various former warring states. The final line of fortifications extended over 3,000 miles, known today as the Great Wall of China. It took 400,000 young, strong labourers many years to complete this work. The Great Wall has since been overbuilt by following generations, and now stands taller and more solidly constructed than in Qin Shi Huang's reign. Qin Shi Huang continued to offer preferential treatment to intellectuals and created an official doctoral position for them. These doctoral positions were titular and did not carry power and associated responsibilities. It did however signify their scholarly achievements, and is equivalent to the modern-day PhD degree. Whenever there was a vacancy in the government, these doctoral scholars were the likely candidates to fill the position. These intellectuals came from a myriad number of schools known as 100 Schools, including Taoism and Confucianism. Some were male witches who claimed that they could locate deities or find recipes for immortality. It was not uncommon that the intellectuals would discuss or even dispute over social and political issues. 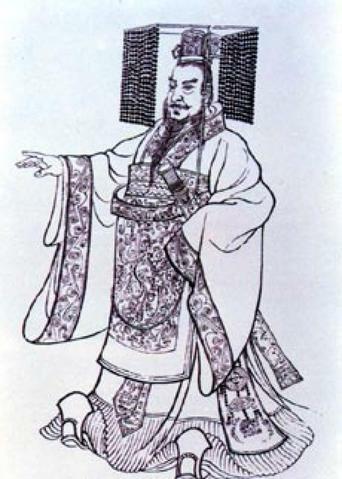 When the discussion or dispute got in the way of existing policies, Qin Shi Huang would silence them. Some doctoral scholars would continue to critique the contemporary policies and political affairs, which would result in even harsher orders from Qin Shi Huang. In 213 BC, Qin Shi Huang issued an order to bury alive 460 doctoral scholars. He also ordered the destruction of all historical archives of earlier states, privately held works of 100 Schools, including the Confucian school, and other books with the exception of the Qin Historical Archive, books on medicine, fortune telling, agriculture, National Doctoral copies of Classic of Poetry and Classic of History. Decrees were also issued to prohibit the discussion of the Classic of Poetry and the Classic of History to rule out any possible reflection on contemporary politics via the indirect discussion of historical events. Violators were prosecuted to the fullest extent of law, which included death penalties. Paper was not invented back then and all books were written on bamboo pieces, tied with thin ropes. Education was not widespread at that time and highly educated scholars were few in number. Consequently, the burning of bamboo books and burying of scholars have been passed down in history as a vivid description of Qin Shi Huang’s reign. In 210 BC, Qin Shi Huang became ill while inspecting the country. He died, whilst being rushed back to the capital, at age 49. The political innovation after Qin Shi Huang’s unification of China set a standard that later generations of imperial rule modelled for over 2,000 years in China. Even in today’s China, people still see the Qin legacy of the Cabinet and county setup in government configuration. Unfortunately, the burning of the books and burying of the scholars have also carried on, in modern day forms, into this Internet age. Some sinologists contend that most of the 400 plus scholars Qin Shi Huang buried were male witches, who claimed they could put the emperor in touch with deities and help him find the recipe for eternal life. Historical archives have recorded that four such witches spent an exorbitant amount of money in search of deities and eternal life for the emperor. They failed to return upon failing to deliver on their promises. Outraged by the blatant lies, Qin Shi Huang ordered the live burial of all witches, which totalled over 400. One of the four witches who escaped was named Xu Fu. Xu led 3,000 boys and girls and various Chinese technologies and artefacts to sail east in search of deities, but he never returned. According to accounts in both China and Japan, Xu reached Japan. The agricultural and other technologies he brought along helped end the Stone Age and usher in a new phase of civilization in Japan. In ancient Chinese folk lore, people associated Qin Shi Huang with ruthless tyranny. Emperors were advised by scholars not to take him as an example, though none of this advice was heeded. At the same time, a number of scholars have held a rational understanding of the historical role of Qin Shi Huang. After all, the unlimited imperial power, the Nine Cabinet and County systems he set up, and the immense territory he conquered have all had unparalleled impact on the generations of China leaders who succeeded him. Major constructions, including the Great Wall and the luxurious Epang Palace, and military campaigns against the Xungnu nomads to the north and the ancestors of today’s Viet Nam to the south, had financially strained the Qin Dynasty. People, who lived in hardship, also complained about Qin’s harsh rule of law. Only three years after Qin Shi Huang’s death, the Qin Dynasty, the fourth in Chinese history, collapsed in peasant uprisings across the empire.